Light up your trick or treat path. Illuminate your walkway for trick or treaters by making a “Boo” path. Craft lighting is particularly useful with this type of DIY. There are tons of creative Halloween themed projects using craft lighting that can brighten up your walkway without detracting from your spooky curb appeal. Wrap trees. Christmas lighting isn't just for Christmas. Use purple and orange lighting for the perfect Halloween ambiance; trick-or-treaters will appreciate having a little extra light walking through the neighborhood. Treat bags. Skip the single pieces of candy this year and make treat bags with healthier alternatives like “boo-nanas” made with bananas and peanut butter. Halloween themed treat bags have all the festivity without the cavities. Use your own custom made printable to seal the bags or keep it simple with orange and purple ribbon to secure the sweet or salty treats. Buying snacks in bulk can come in handy when saving for those Christmas presents in a couple of months. Throw a plastic spider in the bag for an added scare bonus! Design your pumpkin. Carving pumpkins is a fun family tradition. Who doesn’t love the roasted pumpkin seeds that come from it? But carving isn’t the only way you can spice up those pumpkins for Halloween. There is an array of creative ways to make those pumpkins not only look festive but chic as well. Go original with your costume. Cats and Jokers are timeless but when it comes to costumes these days originality is always a conversation starter at any Halloween party. Get creative with throw backs like these or come up with something completely new and of your own design. You’ll get extra brownie points if people know what or who you are without guessing. Get innovative. A Griswold style holiday isn’t just reserved for Christmas. Going all out for holidays, especially Halloween, can be really fun. 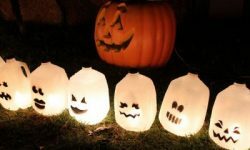 Build a make shift graveyard in your front yard or use chicken wire to make spooky ghost dresses that you can light up from the inside. Halloween is a time of fun, fright and festivity. From lighting to pumpkins to costumes, Halloween is an amazing time of year for "witch"-ever craft you choose.